Final results: Netanyahu's Likud scores decisive victory in Israeli election, set to win 30 Knesset seats, Zionist Union gets 24 Netanyahu calls for 'strong' government to safeguard security, welfare Meretz leader Zehava Galon resigns in wake of election results. With nearly all votes counted, Benjamin Netanyahu's Likud party is set to emerge as the election's big winner with 30 seats. The Zionist Union trails behind with 24 seats. The Joint List of Arab parties is the third-largest party at this point, followed by Yesh Atid, Kulanu, Habayit Hayehudi, Shas, Yisrael Beiteinu, United Torah Judaism, Meretz and Yahad. President Reuven Rivlin said he would work for a national unity government. Ballots were cast at 10,372 polling stations throughout Israel. There are 5,881,696 Israelis (citizens over the age of 18) who were eligible to vote today for the 20th Knesset. Latest opinion and analyses: Netanyahu resorts to race-baiting in attempt to win elections | Netanyahu, Herzog fight Election Day battle of the gap | A last-minute bid to block Netanyahu’s ‘rescue me’ campaign (Yossi Verter) | A black hole at core of Israeli electoral politics (Aluf Benn). 11:15 A.M. Labor MK Shelly Yacimovich says Isaac Herzog told her that the Zionist Union won't join a Likud-led government. "This morning I spoke with Herzog and he explicitly told me that we are going to the opposition," she told Army Radio. 9:56 A.M. Meretz chief Zehava Galon officially announces that she will resign from chairmanship in the wake of the election results. 8:32 A.M. Moshe Kahlon: "Netanyahu spoke with me and said his intentions are serious. I am waiting for the results. There were never any personal issues, only differences in ideology that I hope to resolve now with a government focused on social aspects." 7:45 A.M. Zionist Union's Herzog and Livni: "This is not an easy morning for us and for those who believe in our way. We will lead the fight, together with our partners in Knesset, for the values believe in. We will fight on behalf of the citizens of Israel for social justice, diplomatic horizon, equality and democracy in hope that we can maintain a just, safe Jewish and democratic state. We thank from the bottom of our heart to all those who believe in us and in our way." 6:50 A.M. Meretz leader Zehava Galon says if final results give Meretz four seats, she will resign from Knesset in order to allow Tamar Zandberg to remain MK (Ilan Lior). 6:06 A.M. With 99 percent of the ballots counted, Likud is increasing its lead with 30 Knesset seats, compared to the Zionist Union's 24. 3:23 A.M. With 60 percent of votes counted, Likud leads with 23.73 percent over Zionist Union's 19.07 percent. Yesh Atid stands at 8.92 percent, the Joint List at 9.63 percent, Kulanu at 7.53 percent, Habayit Hayehudi at 6.4 percent, Shas at 5.88 percent, Yisrael Beiteinu at 5.26 percent, United Torah Judaism at 5.15 percent, Meretz at 3.95 percent and Yahad at 3.04 percent. 2:30 A.M. The chief Palestinian negotiator expects Prime Minister Benjamin Netanyahu to form the next Israeli government and has declared that the Palestinians in turn will push forward with diplomatic efforts at the International Criminal Court. 1:10 A.M. Netanyahu: "Dear friends, against all odds we have achieved a great victory for Likud, for the national camp which is headed by Likud, for our people. I am proud of the Israeli people, who recognized what's important and stood up for real security, economy and social welfare, which we are committed to. "This is what's important to everyone, Jews and non-Jews alike," he said. "All of you are important to me. "Now we must form a strong and stable government that will care for the security and welfare of all of Israel's citizens," he said. 12:25 A.M. Yesh Atid Chairman Yair Lapid: "We are the biggest centrist party, and will remain a political force for many years to come." 12:16 A.M. Zionist Union Chairman Isaac Herzog on the exit polls: "These results will bring Labor back into power." He calls on the "social parties" to unite under him to form "a real reconciliation government." "This is a big victory for the Labor Party, which hasn't done this well since Yitzhak Rabin won in 1992." 12:20 A.M. Yisrael Beiteinu Chairman Avigdor Lieberman says his party's five Knesset seats are a triumph over attempts to "take out" his "entire party." Lieberman says the close election results are further proof that Israel needs a different system of government. Shas Chairman Arye Dery says this election has been the "toughest we have ever experienced." "This was a great battle for legacy, a struggle for a path, a struggle of leadership, a very tough struggle," he said. "But, thank God, the way of the truth won, the Torah's way won." He said that he made efforts to unite with Eli Yishai, but the latter resisted. Zionist Union MK Shelly Yacimovich suggests that Shas and Moshe Kahlon's Kulanu may join a government led by Isaac Herzog. "You treat Kahlon like he's in Netanyahu's pocket, and Shas like it's clearly with Netanyahu," she said in an interview with Channel 2. "People say a lot of things before the election. It's possible that they will understand that they could fulfil their desires under Herzog as prime minister." 12:15 P.M. Kulanu Chairman Moshe Kahlon says he will work with any party working on social, economic lines. 11:59 P.M. Channel 1's corrected exit polls indicate Eli Yishai's Yahad party has crossed the electoral threshold with four Knesset seats. Palestinian President Mahmoud Abbas should abandon negotiations with Israel following the elections in the Jewish State, Hamas official Ismail Radwan says in the Gaza Strip. 11:34 P.M. Kulanu Chairman Moshe Kahlon says on Twitter that his party's election result is a "great success." 11:27 P.M. Zionist Union Chairman Isaac Herzog is holding talks with potential coalition partners as part of an effort to form a broad government that excludes Netanyahu and Bennett. The Zionist Union says Prime Minister Benjamin Netanyahu's and Habayit Hayehudi Chairman Naftali Bennett's celebration is premature, claiming the rightist bloc has "crashed." 11:21 P.M. The 2015 election had 71.8% voter turnout, up from 67.8% in the 2013 election. The 2009 election had 65.2% voter turnout, compared to 63.2% in the 2006 election (Ofra Edelman). 11:15 P.M. Avigdor Lieberman on whether he will join a coalition headed by Netanyahu: "Why not? ... we should join the friends who worked hard and gave everything they could. We can't talk of defeat, it was a difficult journey." 11:00 P.M. Joint List Chairman Ayman Odeh: "The list is a success story. More than 65% of the Arab public voted, and that was a positive referendum for the list and its future." The party expected to get 14-15 Knesset seats, but has gotten 13, according to the preliminary results. MK Ahmad Tibi of the Joint List: "The general result is disappointing, but the Joint List has won the support of the public, Marzel has disappeared and the public said Nyet to Lieberman." 10:57 P.M. Habayit Hayehudi leader Naftali Bennett, whose party won a disappointing eight Knesset seats according to the exit polls, said his party is a "long distance runner." Likud officials estimated Netanyahu will work toward forming a national unity government with Zionist Union's Isaac Herzog. 10:48 P.M. Kulanu leader Moshe Kahlon told Likud's Benjamin Netanyahu and Zionist Union's Isaac Herzog that he will decide on his next move only after the full results are tallied. Kahlon's party won 10 Knesset seats according to the exit polls. Zionist Union, which gained 27 Knesset seats according to the exit polls, said in response: "Likud keeps misleading. The rightist bloc has shrunk. Everything is possible until the real results are in, when we can know which parties passed the electoral threshold and which government we can form. All the spins and statements are premature. A negotiating team has been formed in an effort to form a government led by Herzog." Likud leader and Prime Minister Benjamin Netanyahu responded to the exit polls, which gave his party 27 Knesset seats, a tie with Zionist Union, announcing a "great victory for Likud." Israeli President Reuven Rivlin made clear to political officials on Tuesday evening that he would work for a national unity government. Channel 10 and Channel 1 both gave Likud and Zionist Union 27 Knesset seats, while Channel 2's exit poll gave 28 seats to Likud, and 27 to Zionist Union. Officials in the Zionist Union voiced "very careful optimism" with their projections of the election results. A party official said the voter turnout in their bases have been relatively good. After Prime Minister Benjamin Netanyahu urged his supporters to go and vote, warning that his rule is in danger because "the Arab are voting in droves," Likud MK Gila Gamliel expressed her happiness with reports of high voter turnout among Arab citizens. A Twitter account purporting to be the official account of the Hamas' armed wing called on Israeli Arabs to vote for the Joint List. We ask all our supporters with followers in the occupied land, ask them personally to go and vote for @Ayman_Odeh_TJL ! 2 hours left! Earlier, Palestinians, joined by Israelis and foreigners, marched near the West Bank town of Abu Dis, in effort to send a message against the settlements on Election Day, AFP reported. Zionist Union leader Isaac Herzog said Prime Minister Benjamin Netanyahu is "panicking," adding that his "lies" earlier on Tuesday prove that he is a "hysterical, divisive, inciting prime minister." Prime Minister Benjamin Netanyahu said "no one will shut us up," after the Central Elections Committee barred the media from airing his address, deeming it "illegal election propaganda." "All day, politicians have been talking in the media. Tzipi, Bougi and Yair Lapid talked in every possible TV studio and issued obvious campaign propaganda. The only one barred from talking over the media – is me. The Likud prime minister," Netanyahu said in a Facebook post. It should be noted that Netanyahu appeared earlier on Tuesday on a Channel 10 talk show. In his statement, posted on his Facebook page, Netanyahu called on his supporters to vote, saying the margin between Likud and the Zionist Union is due to "foreign funds" funneled to "leftist groups." Netanyahu also referred to his earlier statements that "the right's regime is in danger. The Arabs are moving in droves to the polling stations." Netanyahu said that there's nothing wrong with Jewish and Arab citizens voting as they see fit, but accused "funds from foreign governments and organizations" of being used to bring Arab voters "en masse" to the polling stations. The Central Elections Committee has issued an injunction against live broadcasting a statement by Prime Minister Benjamin Netanyahu later this evening. Habayit Hayehudi Chairman Neftali Bennett accused the left of receiving "foreign funds" to finance their campaign, saying "foreign nationals" are present at the polling stations, encouraging voters to cast their ballots in favor of leftist parties. Supermodel Bar Refaeli called on Israelis to vote, tweeting: "We voted. If you didn't vote yet, there's still time, just don't give it up." Shas responded to the Central Elections Committee's injunction against its flyers promising those who vote for the party a "key to heaven." Joint List candidate and MK Dov Khenin petitioned the Central Elections Committee to remove the Likud campaign that casts Arab voters in a negative light. "A prime minister who campaigns against voting by citizens belonging to an ethnic minority is crossing a red line of incitement and racism. This is especially severe on Election Day, when the message to Israeli citizens is to participate in the elections, vote, and take part in the democratic system. A statement like that, issued by the prime minister, shows that he has completely lost his way and that he is ready to break all the principles of democracy to safeguard his regime." Isaac Herzog and Tzipi Livni, heads of the Zionist Union, have been touring polling stations across Israel since Tuesday morning. "I really feel that we're going to make it, I see that people are not just saying good luck to me out of politeness, they hold me and actually pray," Livni told Haaretz. Likud is troubled over high voter turnout in the Arab community. Prime Minister Benjamin Netanyahu recently uploaded a video to his Facebook page in which he said: "The right-wing government is in danger. Arab voters are coming out in droves to the polls. Left-wing organizations are busing them out. We have no V15, we have Order 8 [code for emergency call up to IDF reserve duty], we have only you. Get out to vote, bring your friends and family, vote Likud in order to close the gap between us and 'Labor.'" 12:56 P.M. Voter turnout as of 12:00 P.M. stands at 26.5%. 12:25 P.M. Likud response to the Central Elections Committee's statement on old recording of Moshe Kahlon endorsing Likud: "There is, nor was there, any forged video clips. The clip was an old recording of actual remarks made by Moshe Kahlon two years ago, in which he praised Prime Minister Netanyahu for his economic and social achievements. In every election campaign it is customary to quote politicians' previous statements. At the same time, Likud honors the Central Elections Committee's ruling and will honor it." 10:55 A.M. Moshe Kahlon comments on Likud's illegal use of recordings. "It's a shame they sunk so low. That's not the way, that's not democracy. Even in campaigns there are limits and red lines. Here, they crossed all of them." 10:52 A.M. Meretz chairwoman Zehava Galon casts her ballot in Petah Tikvah. "I trust Meretz voters, and we are entering a new age. Metretz voters know that either there will be a Knesset without Meretz, or a government with Meretz. In order for that to happen, all Meretz voters who considered voting for the Zionist Union must vote Meretz – we will be big and strong, and only that will make Herzog prime minister," said Galon. 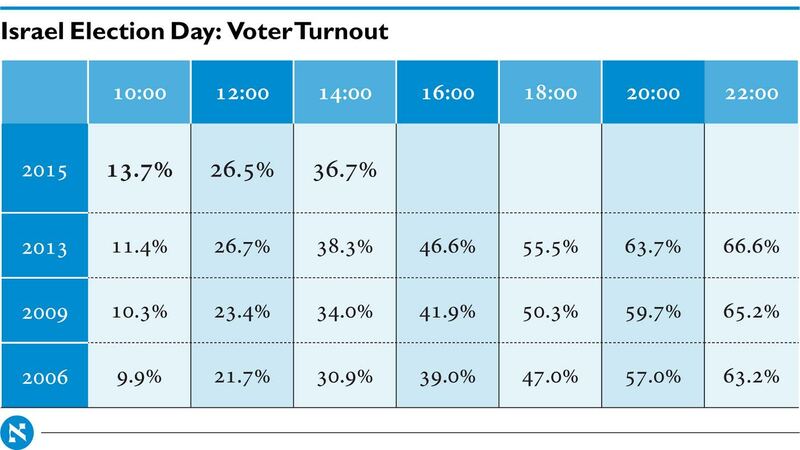 10:40 A.M. As of 9:00 A.M., 7.4% of eligible voters have cast their ballots. 9:10 A.M. The website for the Central Elections Committee has crashed, less than two hours after the polls opened, due to heavy traffic. 9:05 A.M. Yisrael Beiteinu chairman Avigdor Lieberman casts his ballot. "I call on all Israelis to go out and vote for any Zionist party, it doesn't matter if it's Meretz, or Yisrael Beiteinu or Habayit Hayehudi, the most important thing is to go out and vote for a Zionist party to preserve the Jewish Zionist character of the State of Israel." 8:20 A.M. Arye Dery casts his ballot in Jerusalem "This is the day we've waited for. We worked very hard for this day, and with God's help we hope that our work will bring results, and I hope that the results will be a surprise for the pollsters." 7:40 A.M. Habayit Hayehudi chairman Naftali Bennett casts his ballot in Ra’anana. "This morning I put on my tefillin and prayed for the people of Israel to be united, for the people of Israel to be strong. Today is our day. This is the day for those who love the land of Israel, this is the day for those who love our flag, this is the day for those who love our country, this is our day. Today, Israel lifts its head. I'm missing my friend, Uri Orbach, of blessed memory, this morning. He once said 'Habayit Hayehudi is not a bridge to be walked on, but rather a bridge that connects people.' The people of Israel will be connected." 7:00 A.M. Israelis begin casting their ballots as polls open throughout Israel.